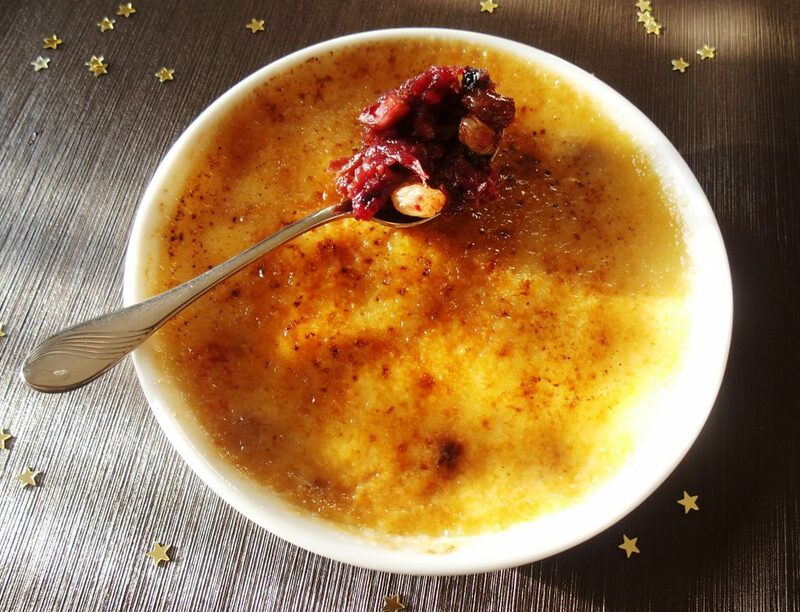 Brulee literally means burnt cream. Contrary to popular opinion, this dessert isn’t too difficult to make. I find for best results use individual ramekins to create this creamy, rich, toffee topped French dessert. Best made the day before. Caramelise sugar just before serving. Lightly grease 4 x 1 cup ramekins. Set aside. In each ramekin, spread 2 tablespoons of Christmas Mince over the base. Pour milk and cream into a saucepan along with kaffir lime leaves or lemon peel. Bring to the boil. Remove from heat. Set aside to cool. 10-15 minutes. Remove leaves or peel. In a large bowl beat yolks and sugar together until thick and creamy. Slowly pour in cool milk, stirring continuously. Evenly pour into prepared ramekins. Place in a roasting dish. Pour in enough cold water to come half way up the side of ramekins. Cover baking dish with tinfoil. Bake at 160ºC for 40-50 minutes or until set. Custard will have a slight wobble when cooked. Carefully remove from water and set aside to cool. Refrigerate. Just before serving, preheat grill. Sprinkle top of custards with a thin layer of sugar. Grill until bubbly and golden. Stand for 5 minutes, repeat sugar process. This will give a deliciously thick caramelised top. Garnish with coconut threads, lemon zest and enjoy immediately. Place a doyley on a decorative saucer, put on Brulee, carefully crack crust to show cream. Yum ! Our thanks to Australian-based food writer Anne Morton for this delightful recipe!